The Oslo Server is a great example of the new industrial style furniture that has been growing into one of the most popular trends in the modern furniture world. 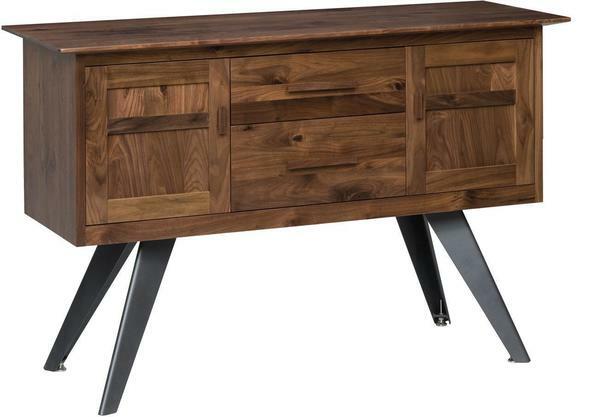 The sleek metal legs sit atop a contemporary style wooden server cabinet with wooden drawer & door pulls & straight lines. These metal legs and wooden top are completely opposite materials, but complement each other beautifully. Create a custom look for your server by choosing the wood & finish type along with the metal base color, door style, and hardware type. For additional information on this Industrial Style Oslo Server, contact one of our knowledgeable furniture specialists.